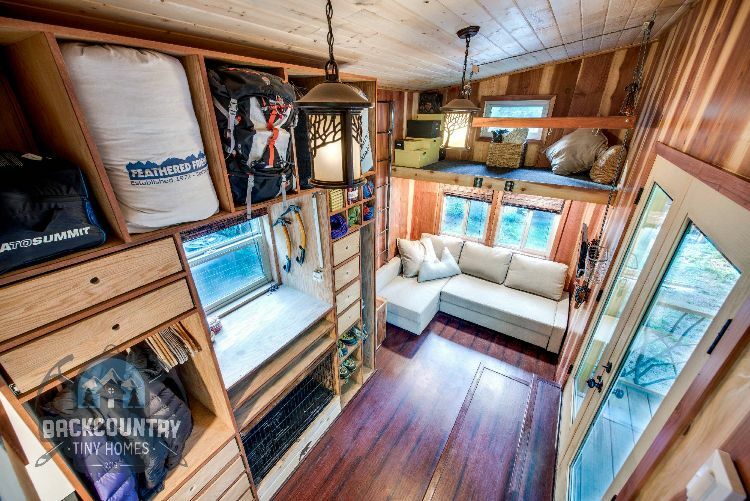 From the outside, this 204-square feet tiny house (383 including the lofts and the roof), produced by a pair of Massachusetts ex-patriots (who moved to Oregon), may not look like your typical tiny home. Describing themselves as both engineers and mountaineers, Luke and Tina's creation is eclectic, purposeful and stylish. 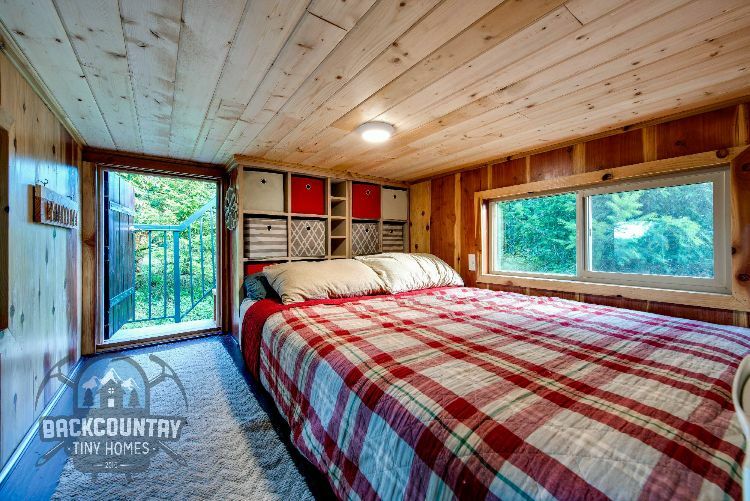 Engineers – in this case, the proprietors of Backcountry Tiny Homes – are very practical folks. 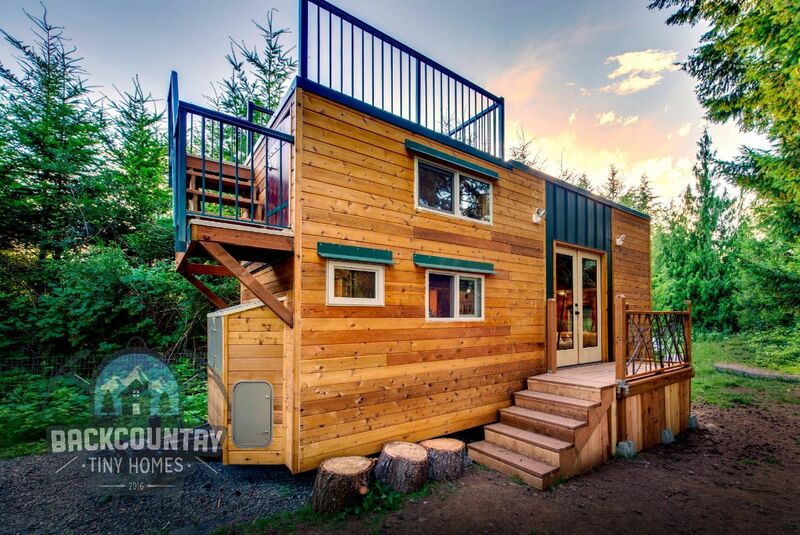 As such, the primary tiny house rule that this couple ignored is the one that says a tiny house is not a miniature mansion. You can't stuff it to the gills with every item you used to own when you lived in a 1,600 square feet home. You have to make sacrifices. Is that true? Take a look at the company's Basecamp model. A roof porch with the added feature of a second-story porch landing can't be that bad of an idea for a home where space is the most in-demand commodity. The big glass doors are terrific, and the craftsmanship is exemplary. That much is clear from the start. Here's a view of the same space, but from a little further back– from the bedroom loft, actually. 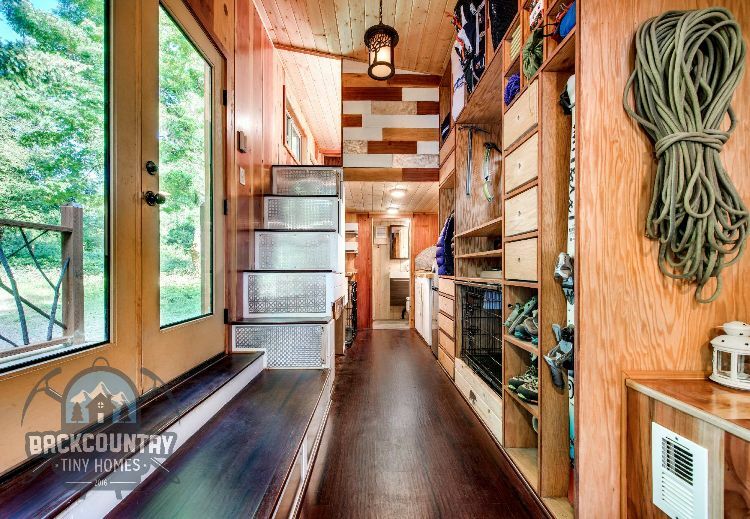 You see more and more shelves, cubbies and storage compartments. 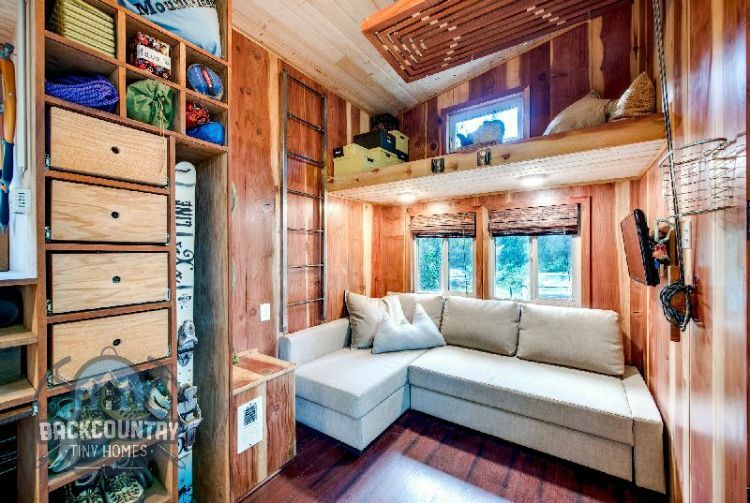 Not missing a trick, even the deep-set window sill on the left is space for hanging some mountaineering gear. Under that window sill: more storage space. Looking down the center of the house in the other direction, you find a magnificent kitchen. 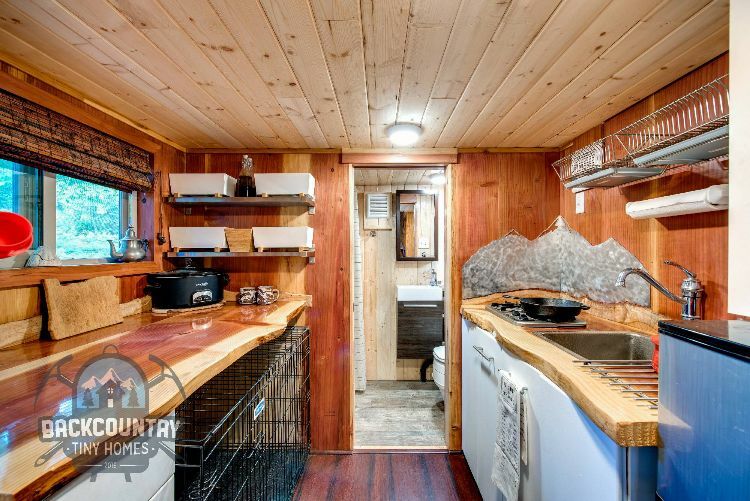 It features tons of counter space made with beautiful redwood slabs, wire baskets for drying dishes on the right and storage against the back wall and under the counter on the left. Both counters have natural edges rather than straight-cut edges, which gives the kitchen a friendly feeling. The kitchen floor is also beautiful. The bathroom is in the background. 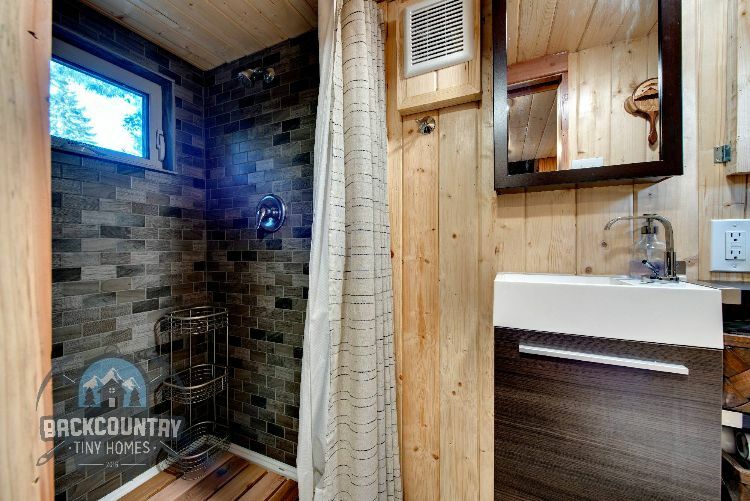 Who says a tiny house shower has to be cramped with your feet in a farmer's aluminum water tu, and a handheld water nozzle? Not these designers, apparently. This would be a classy shower in any home. 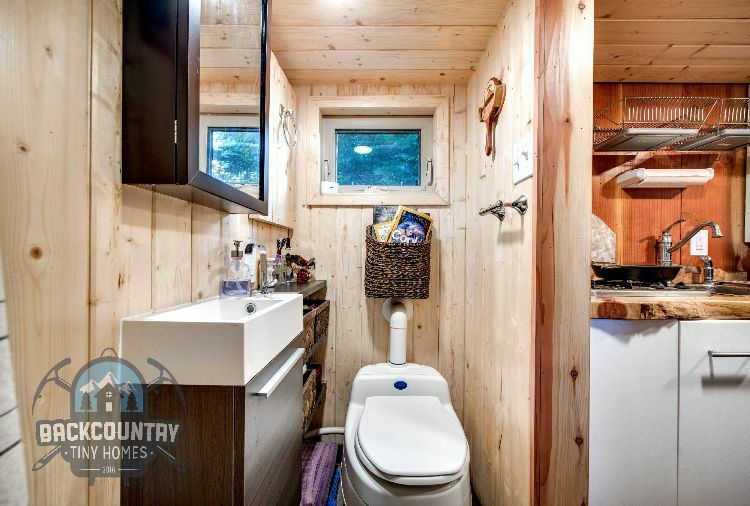 The bathroom also features an indoor privy and a narrow sink with a cabinet underneath and a medicine cabinet against the wall. In the photo above, you see the glass doors on the left actually open to a step or two to make it to the first-floor level. The silver-colored risers on the left are the stairs that lead to the master bedroom, which has a playfully designed wall hiding the bed. And here's the master bedroom. 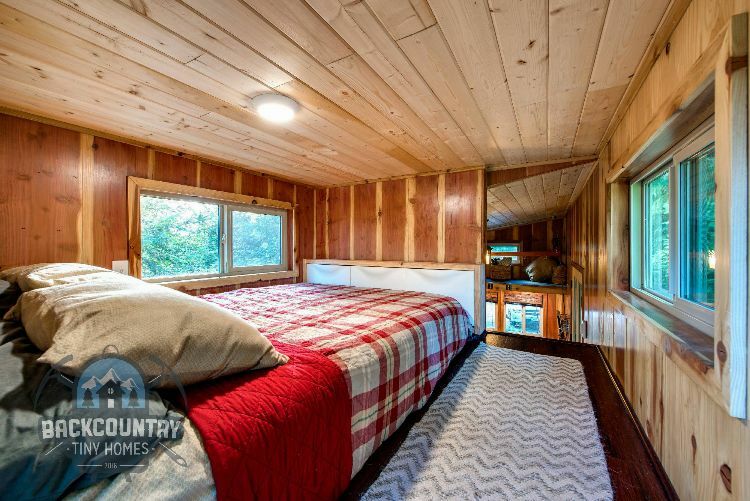 Look at that floor space – the room complimented by windows and walls paneled with beautiful redwood. A reverse view of the bedroom helps show off the second-story porch and expansive glass door that adds so much light to the room. More storage cubbies are placed behind the bed, of course. Let's call this the coup de grace. 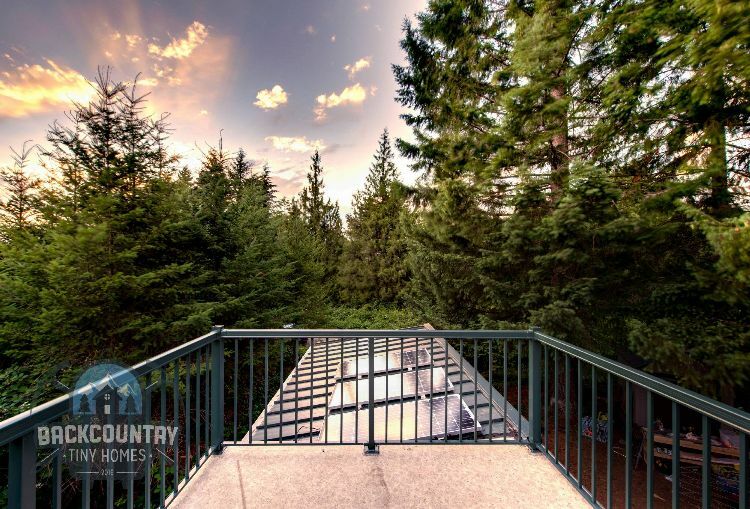 The view from the second-story porch reveals the solar panels that provide the couple with electricity. Those practical engineers at it again, leave no stone unturned.